HF: The Hong Kong Heritage Project’s latest Quarterly Newsletter, 2015/1, contains a wealth of information for those interested in HK’s history and especially its industrial past. HKHP’s Melanie Li is presenting a lecture on these districts at a Hulu Culture seminar on 13th June 2015. 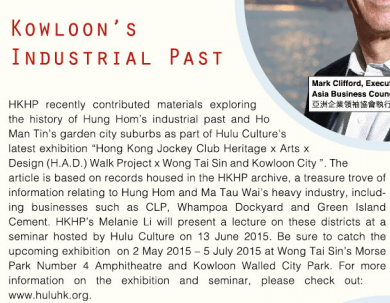 There will also be an exhibition from 2nd May to 5th July 2015 in Morse Park, Wong Tai Sin. Hong Kong Heritage Project is a non-profit organisation established in 2007 to preserve history and promote the appreciation of heritage in Hong Kong. Its Archive holds a unique collection of audio, visual and documentary records, as well as Hong Kong’s largest oral history collection of interest to both local and overseas researchers and academics.